If you're looking for affordable ways to keep your children entertained, you might be interested in trying some coat hanger crafts for kids. Crafting with your children is a great way to encourage creative thinking and spend time together as a family. Just about every family has an excess of coat hangers. 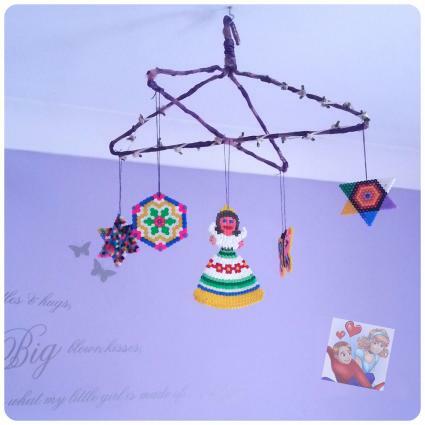 Lucklily, you can use these old hangers to create some fun projects with the kids. For the most part, these crafts use items you probably already have around the house. They're perfect for a spontaneous family crafting session! These wings are perfect for Christmas pageants or other holiday events, and you can easily modify the shape to use them year-round. 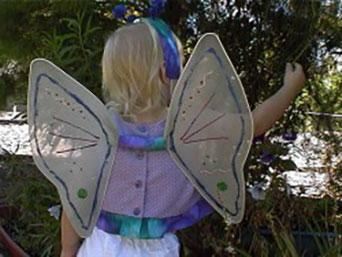 This is a good craft project for older kids, since it requires some dexterity to shape the wings. If you're working with younger children, you might consider making the wings yourself and allowing the kids to do the decorating. Begin by using the wire cutters to cut the twisted part off both coat hangers. This is best done by an adult. Use your hands to straighten the wires. Bend a third of each wire back against itself. Slip the bent part of each wire into a knee-high, and slowly bend the long end of the wire to form the shape of an angel's wing. Use the packing tape to secure the knee-high and the two ends of each wire. Use more packing tape to attach the two wings together. Carefully wrap ribbon around the wings to hide any of the packing tape that might show. Leave the ends long, since this is how you will attach the wings to the child. Now it's time to decorate the wings! You can use glitter glue, markers, or anything else you have handy. Allow the wings to dry, and enjoy your dress-up time. You can change the shape of the wings to resemble a butterfly or a bird if you desire. Wreaths are a fun craft to make for the holidays or any time of the year. To make your child's wreath appropriate for year-round display, choose colors that complement your décor. These wreaths also make great gifts for grandparents and other relatives. Holding the hook part of the hanger in one hand, pull steadily on the bottom of the hanger to create a long, flat loop. Apply slow pressure to bend the doubled hanger into a wreath shape. Insert the hook in the looped end, and bend it closed. 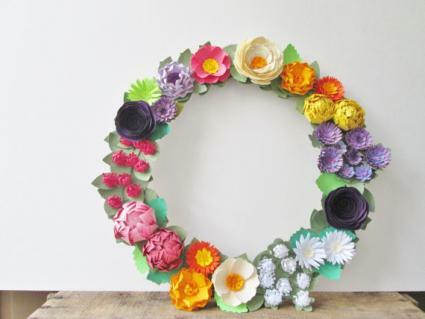 Use purchased flowers or homemade paper flowers to decorate your wreath. String a double length of embroidery floss on the needle, and tie the end securely to the wire wreath form. Pierce the bottom of the flowers, and attach them to the wreath with the floss. Add a loop of ribbon to hang your wreath, and decorate the bottom with a ribbon bow. This craft is a great way to display kids' favorite art pieces. It makes a great decoration for a child's room, and it can also be a fun new baby gift. Bend one the hook of one hanger so it is perpendicular to the hanger body. Slightly stretch the other hanger, and fit the two hangers together crosswise. The hooks should be together, but the hanger bodies should be going opposite directions. Use twist ties to secure the hangers in this position. You'll need several. With the hole punch, make a hole in the top of each piece of artwork. Tie a piece of ribbon through the hole, and leave the end long. Attach the ribbons to the coat hanger base. You can vary the lengths to give the mobile a more random appearance. 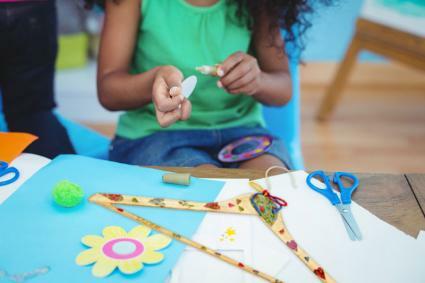 Reusing old household items is a great way to teach kids to be resourceful and frugal, and crafting together does a lot to encourage a child's creativity. These coat hanger crafts for kids are a great way to pass these values on to your child.